Thrift shopping is kind of like a sport. 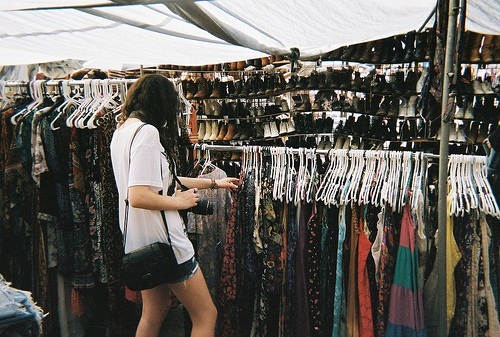 Muscling through racks of clothing and bins of scarves, your goal is to score as many great pieces as possible. If you want to win, you can’t let heavy clothing or accessories weigh you down. Wear a small cross-body bag or carry your money in a pocket, so that you can use your hands and wear flats or sandals to quickly slip in and out of shoes and clothes. A tank top and jeans is my go-to thrifting uniform; it acts as a blank canvas and allows me to picture all the possibilities a piece may have. Thrift stores are often a Mecca for designer castoffs. While most of the racks will resemble DJ Tanner’s wardrobe on Full House, you’d be surprised by the amount of quality vintage pieces tucked between all those ‘90s mom jeans. I recently bought a vintage Diane Von Furstenberg blazer for $15 at a thrift store in Argentina. Hope can be found in thrift stores, but you should brush up on your designers before venturing off, so that you can recognize a good label when you find one. One of the great things about shopping at thrift stores is that the clothing is much more resilient to the wearing effects of time than the fast fashion of today. Good seams and durable fabric are signs of a quality piece that will last for years to come. Also, inspect clothing for any damages such as stains, holes, or broken zippers. Simple repairs can often restore rips and holes can be patched up, but if there is a huge salad dressing stain sprawled across the front of a shirt, slip it back into the rack and forget about it. You will often encounter pieces you never thought you’d wear, such as an oversized blazer with huge shoulder pads. Keep in mind though that almost any piece can be updated and modified to current styles. Remove the shoulder pads, roll up the sleeves, pair it with skinny jeans and a pair of heels, and you have a great going out outfit. Don’t shy away from color or patterns either, as you will find that these pieces can be easily paired with basic items in your closet and build you a wardrobe that is more fresh and unique. While a colorful zig-zag shirt might look like a bad trip in the store, combined with the right complements from your wardrobe, it may begin to resemble Moschino’s latest collection. I hope these tips have inspired you to ditch the mall and head for the racks of the Salvation Army. Be prepared to dig, and don’t be disappointed if you don’t find that one-of-a-kind piece on your first trip. Go often, as new items come in every day. You never know when someone will haphazardly donate her old Tory Burch flats.